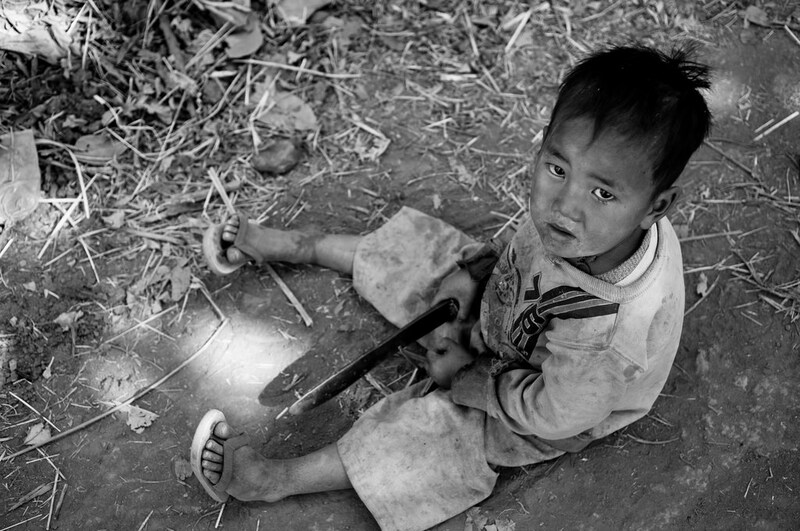 Are Kids Who Play with Knives More Self-Sufficient and Curious? Most kids these days are not self-reliant or self-starters. This isn’t just some old man yelling about how the new generation is a bunch of pansies because they didn’t walk 10 miles to school in the snow either. (I’m not very old and no one walks anywhere where I live.) No, tangible evidence continues to come out about how kids are more dependent and feeble nowadays. For anecdotal evidence, find a 10-year-old and try to pry him away from his smartphone, tablet, or computer screen and you’ll see what I’m talking about. Kids in many other societies (specifically preindustrial societies) are much more independent, interested in learning, and helpful around the house without being asked. What’s the reason for such a huge discrepancy across cultures? The answer is complicated but part of the reason is that adults in other places allow their kids to play with knives. In a recent article called “Playing With Knives: The Socialization of Self-Initiated Learners,” anthropologist David Lancy took a look at how children develop and learn across different cultures. He analyzed observations about parent and child interactions in more than 100 preindustrial societies. In many of those societies, he found children to be much more independently motivated to learn and help out with chores. Part of the reason is that adults have a laissez-faire attitude toward parenting and allow kids to take part in risky behavior, including playing with knives and tools. We were faced daily with Dusun parents raising their children in ways that violated the basic beliefs by which we were raised…We consistently checked our…exclamations of concern or disgust…and [resisted] the temptation to take a “dangerous” object, such as a knife, from a toddler…knowing that in terms of the local culture, children are believed to die from accidents whether they play with knives or not and besides, as one Dusun father put it, “How can you learn to use a knife if you do not use it” (Williams, 1969). So that might be a little too far on the other end of the spectrum, especially since some cultures don’t mind if a child loses a few fingers along the way to self-sufficiency and education. But there’s a lot of evidence out there that shows children who are free to explore on their own and play with tools will learn responsibility, be more likely to pitch in, and have more motivation to learn. 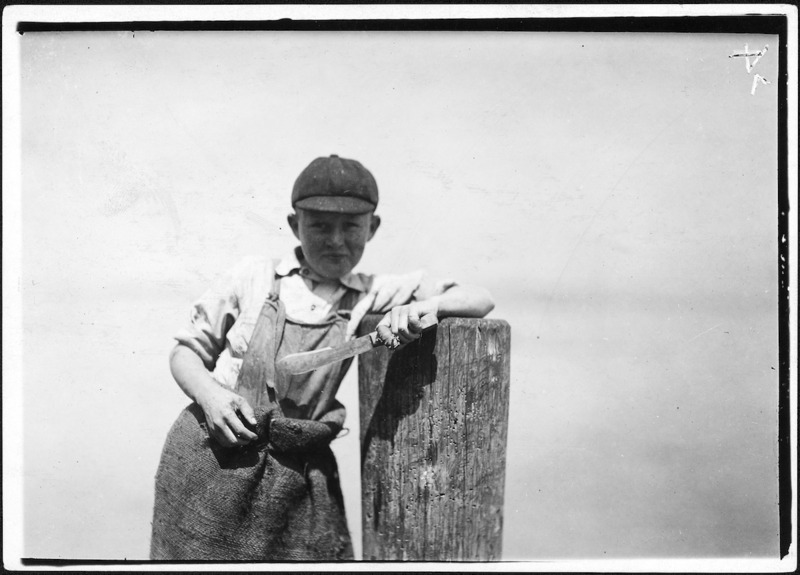 Ralph with a butcher knife while working at a canning factory and nursing a cut finger. Yet the Western world still can’t get over the fact that knives (and freedom in general) are dangerous and should therefore not be given to children, despite the fact that this is how things were as little as a few decades ago. While we may not want to go back to the days where poor Ralph above was working 16-hour shifts at the canning factory and losing fingers left and right, a little freedom wouldn’t hurt. If you’re reading this, you probably don’t need more evidence that we should let kids explore the world more (and play with knives), but unfortunately, the way our society is built, that’s becoming increasingly frowned upon. It’s no surprise Bear Grylls was grilled when he allowed his son to play with knives. At this point, all we can do is keep offering our own children more freedom and responsible access to tools. Just be prepared for the gasps and dirty looks of other parents as Jimmy takes out his pocket knife to cut up an apple for himself. My dad was New York City cop.gave me my first knife when I was 5.never leave home without one! in these days of overprotective parents and their “afraid of everything kids” be careful to train your kids the correct way to use knives. and also never, never allow them to carry to school and never show off! My first pocket knife was at around 8-9 yrs old. I’d say yes it does make a boy more self sufficient. I remember I used that knife many summers while digging for earthworms, cutting fishing lines, gutting fish, and sharpening sticks to cook them over an open fire. Probably not a lot of 9 yr olds today who even do that anymore without adult supervision. I grew up on a farm and carried a knife since I was 6 years old. My son got his first one when he was 12 and , like his Dad, takes one with him everywhere he goes. He carries a Gerber Swagger and I carry a Cold Steel Recon 1 with a 4 inch blade, a Gerber Gator, and an SOG Flashback. My 14 year old nephew is coming down to stay with us this weekend and waiting in my closet is an order from Knife Center. He is getting a ZT folder and a sharpening strop and I am getting an SOG fixed blade/spear combo-my latest craze at 63 years old. It has been here since Monday and we are both dying for Thursday aft. to come -my wife and I are bringing him to our place for the weekend and the first thing we are doing is opening our box of knives together. Life just doesn’t get any better! I had numerous knives and bought many myself at the age of 7 through to today. I love knives and find them useful for work, play and defence BUT our weak UK parliament can’t remember the days when we made our own fun cutting bows and arrows etc – either that or the greedy bastards just want to keep building ghetto after ghetto until there is no countryside. With little done to bridge the rich poor gap they have a fear of poor people having knives so criminalise it. Do not come to the UK unless your a weak liberal leftie, a muslim or have your diaper changed for you as the uK is far more than a nanny state- its mostly owned by arabs or ruskies and whats left of parliament is oppressing the poor to line their own nest. You can’t carry a gun above a single shot even with a licence and knives are just banned.